Dry January is over and now it’s time for Fizz Free February. This is an initiative that was introduced by Southwark Council in 2018 and this year, the aim is to promote national exposure of the campaign and is something that we fully support at Brightside Dental. The aim of the campaign is for you and your family to avoid fizzy drink for 4 weeks during February. 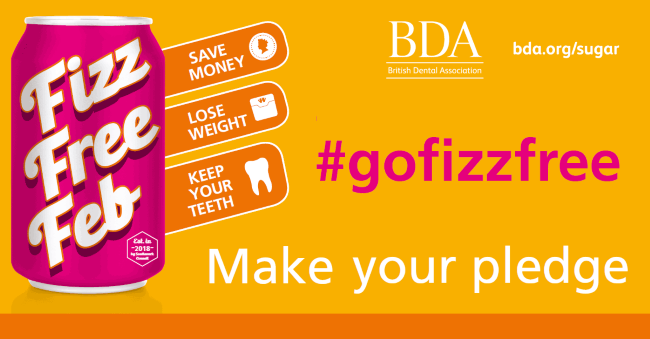 The purpose of the campaign is to raise the awareness of the impact of sugar and fizzy drinks in particular on dental health. As well as sugar being a huge problem with obesity, the other main area is dental decay and among children the biggest impact is with secondary school children aged 11-18. In this age group 170 children per day have dental extractions in hospital under general anaesthetic. Dental decay is one of the few preventable diseases. If you would like further information or advice on how we can help keep you and your families mouth as healthy as possible, email us or call on 020 88884401. This entry was posted in Dental Advice on 5th February, 2019 by Brightside Dental.